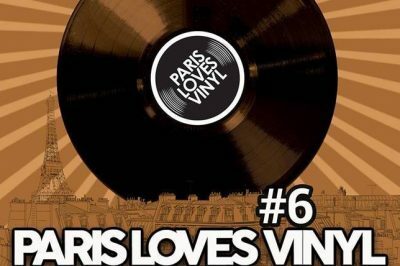 Thinking of visiting Paris in December? Most think of the end-of-year holiday festivities and displays as the primary draw card– and they’re certainly not wrong. But there’s much more to see and do beyond the usual fare. This video showing snow gently dusting bikes, buildings, trees, cars and dogs in Montmartre has no dialogue. 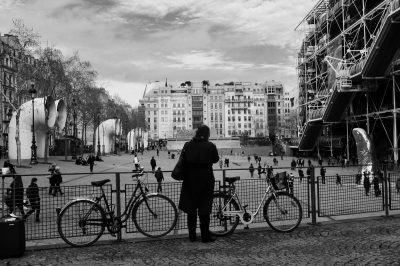 Yet it wordlessly captures the particular beauty and poetry of winter in the French capital: one that too many travelers never see, preferring the city in its more predictable, postcard-friendly spring or summer months. 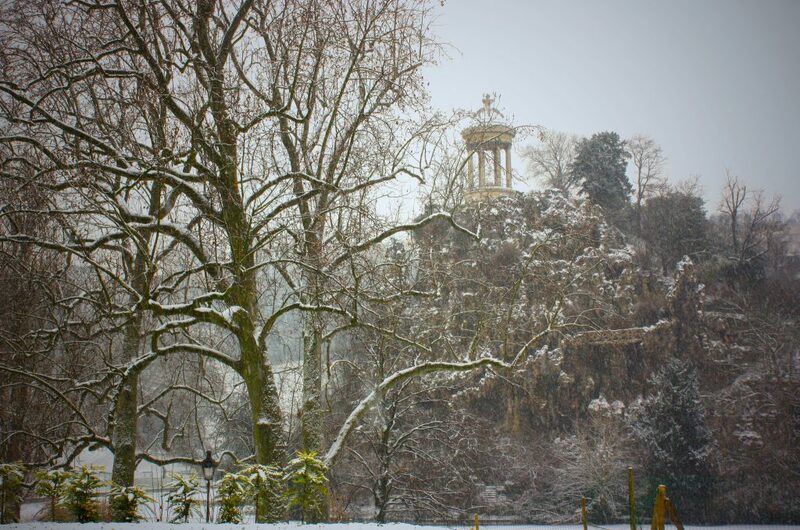 The Buttes-Chaumont park dusted with snow: simply enchanting. But as I point out in my guide to when to go, there’s really no “perfect time of year” to visit. So if you’re disinclined to follow the crowd, a trip to Paris at year-end can be idyllic– and perhaps more importantly, relaxing and enjoyable, even if you have kids in tow. It’s not all about Christmas markets, holiday window scenes and noisy New Year’s celebrations, either (although these are certainly not activities you should overlook, as I detail further on). Beyond these rather frenetic festivities lies the possibility of peace and contemplation. Other enticing prospects: escaping the crowds to enjoy the whistling of wind through bare-leaved trees at Parc Monceau and the Tuileries (pictured above), or of spending a few hours taking in paintings, sculpture or photography at a small, under-appreciated Parisian museum or gallery— minus the summertime crowds, hopefully. The French have an expression for the sort of quiet luxury and indulgence I associate with the city in its wintery guise: “luxe, calme, et volupté.” Translating roughly to “luxury, calm and delight”, the phrase shows up both in Charles Baudelaire’s poem “L’invitation au Voyage” and as the title of a 1904 painting by Henri Matisse. 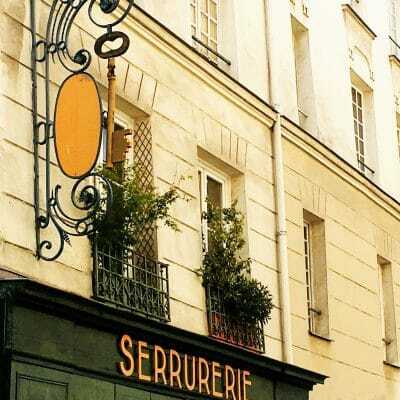 If you’re looking for a little of that ineffable but decidedly French trifecta, read on for a little inspiration, followed by a few more direct suggestions on what’s worth seeing and doing at year-end. Do keep in mind, however, that these are subjective notes and not meant as comprehensive advice on everything going on at this time of year. See the Paris Tourist Office page for that sort of general overview. In December, it’s generally pretty brisk and cold, although in recent years there have been unusual warm spells or many more days than usual where temperatures reach seasonal maximums. I generally advise travelers to pack plenty of warm sweaters, a waterproof coat, hat and shoes, gloves, scarves and warm socks. In case of an especially warm day, layering is always a good idea. Also take note that snow sticking to the ground longer than a few minutes is rather rare in Paris: when precipitation does come, you’re more likely to be regaled with icy rain or sleet. 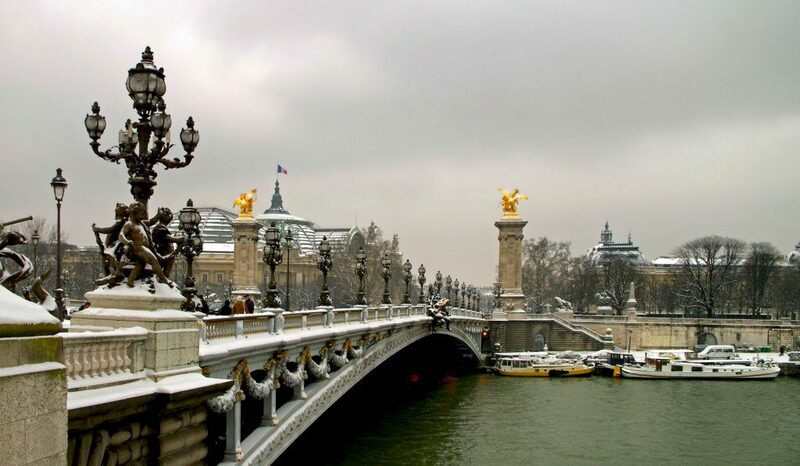 The idyllic images of a snow-blanketed Paris end up being a pretty rare experience, unfortunately, so don’t expect a white December during your stay. Luckily, there are plenty of other ways to get your fix when you’re after traditional seasonal cheer, as I detail a bit further below. As I alluded to earlier, one of the things about year-end in Paris that I find so appealing is the sense of peaceful contemplation and deep quiet that seems to hover over the city. Part of the reason for this is that, especially outside of touristy areas, the streets can be remarkably empty. Parisians are known to be wimps about the slightest icy wind, which means they tend to huddle inside at home or in the city’s innumerable cafes, cinemas and galleries. In fact, a common French superstition is that any cold “courant d’air” (draft) may lead you to catch your death, or at the very least a terrible bout of rhinopharangite (the common cold– doesn’t it sound eons more dramatic in French?) or angine (a vague throat infection or even a simple sore throat). If you thought Parisians mummified their neck area in thick scarves to look chic (which they often do, inexplicably), their enthusiasm for wrapping up is more likely driven by rampant cultural hypochondria; by the local conviction that protecting one’s neck area from the cold will stave off most illnesses. It’s a belief I have a hard time shaking off myself: cold air touching a bare spot on my neck now instinctively prompts me to “protect it” from the mysterious and malign forces of chilled wind. 1. Warm up over gourmet tea or hot chocolate. The gourmet hot chocolates of master French chocolatier Jean Paul Hévin are among my favorites. Sadly, his tearoom closed in 2016, but rumor has is another will open in the near future. Courtesy of Jean Paul Hévin. 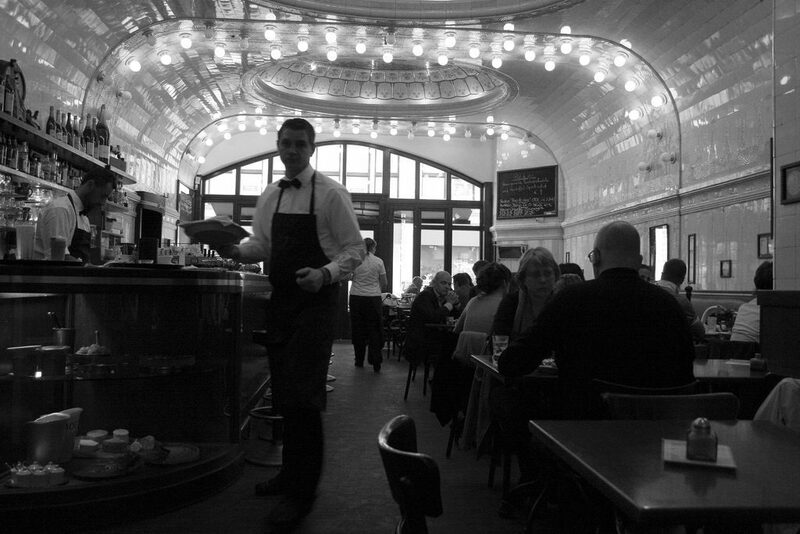 The Viennese-style tearoom Angelina is a favorite for rich, thick hot chocolate, meanwhile (226 rue de Rivoli, 1st arrondissement; Metro: Louvre-Rivoli). See my longer list (over at TripSavvy) of places for good hot chocolate in Paris here. 2. 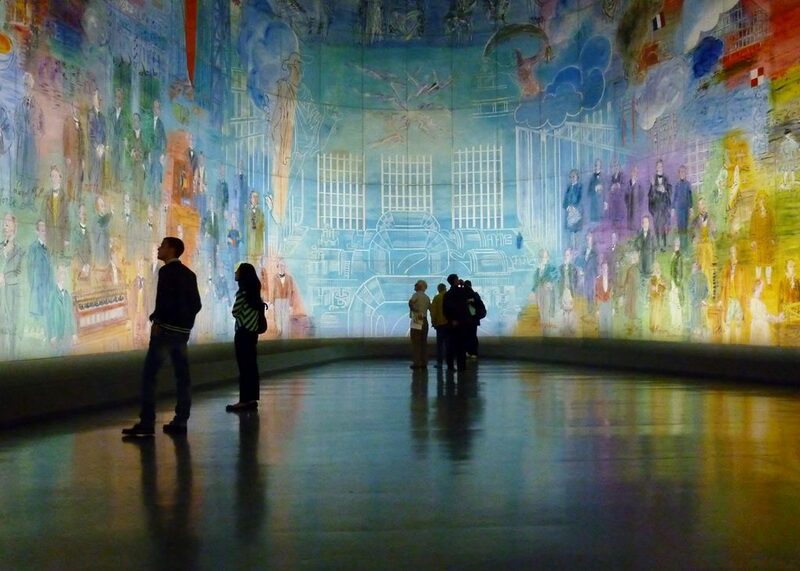 Go soak up some art. For ideas on small and independent galleries to duck into from the cold, see my feature on small museums in the French capital. 3. Take a wintery walk. 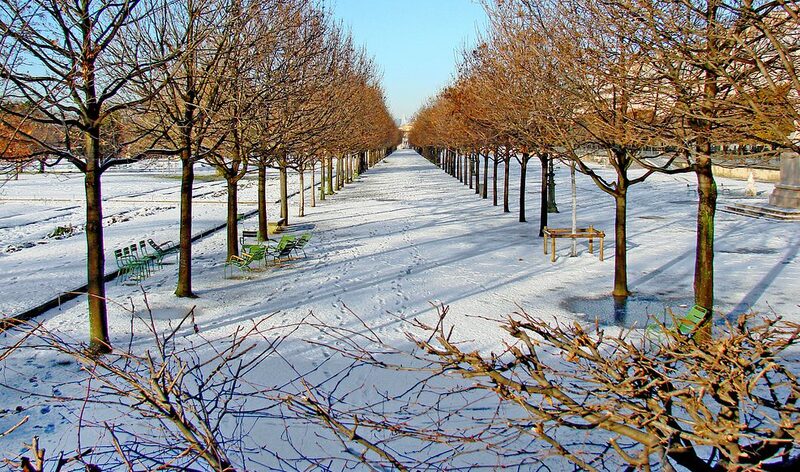 Winter at the Jardin des Tuileries/Image credit: Jean-Pierre Dalbera. Some rights reserved under the Creative Commons license. As long as it doesn’t get too cold, I’m a big fan of wintery strolls. I enjoy bundling up and feeling the slight, invigorating sting of wintery wind on my face (but never the neck! Beware the dreaded courant d’air!) and strolling through lanes of bare trees, or watching the ducks and geese as they float around aimlessly on the steely grey ponds. I especially recommend the massive parks known as “Paris’ lungs” just east and west of the city limits (The Bois de Boulogne and the Bois de Vincennes): both easily accessible by metro, these enormous green spaces offer miles of walking trails, large ponds for admiring the waterfowl, and dozens of varieties of trees. I also love the Romantic-style Parc du Buttes-Chaumont (pictured above), with its artificial grottoes, panoramic viewpoints and impressive variety of beautiful trees, as well as abundant birds. Recently I and a friend witnessed a colony of green parrots inhabiting some of the trees there: a strange sighting, to say the least! For more on the city’s loveliest parks and gardens, see this page. 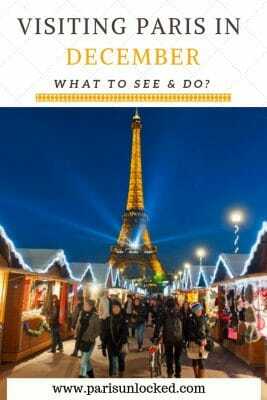 For many, the biggest draw cards of a December getaway to Paris are the holiday festivities, markets and decorations– and I certainly can’t deny their appeal! 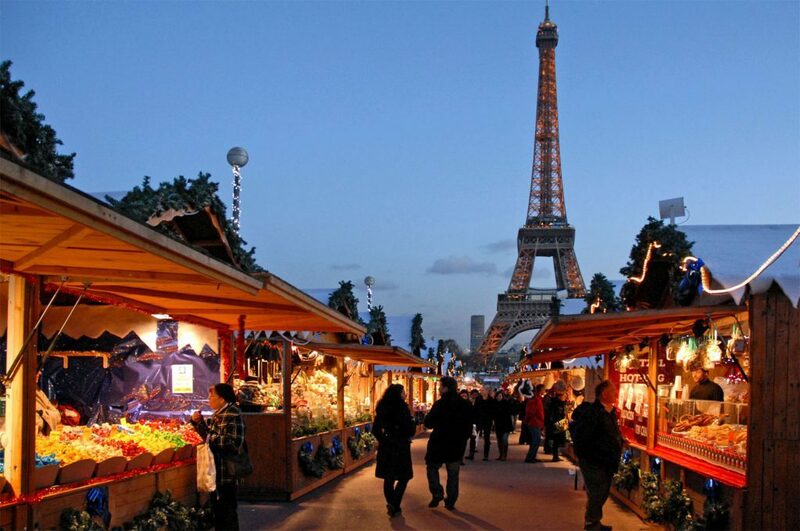 Christmas markets in Paris generally open in late November and run through Christmas Day or, rarely, through early January. While some may find them a touch kitschy– and can’t that be fun, anyway?– the warm Alsatian-style lodges in wood are something I look forward to every year. 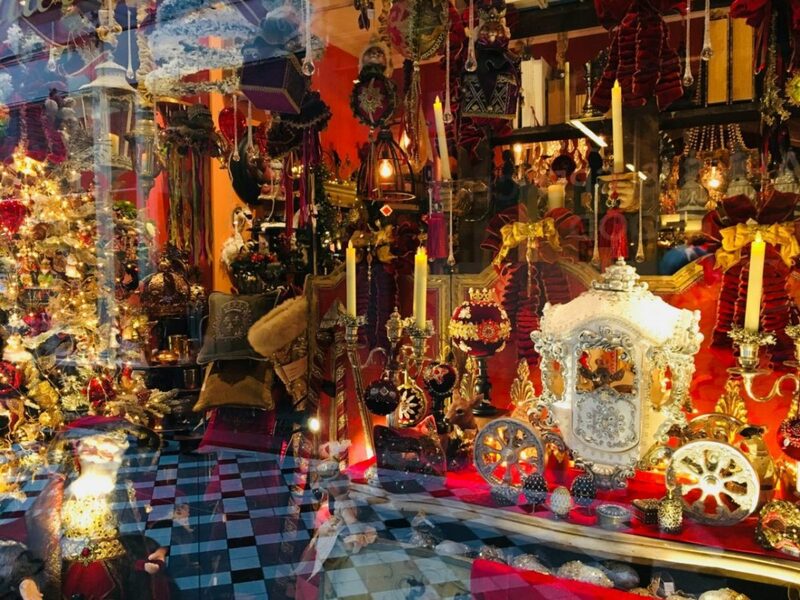 Walking through the stalls, you may or may not be tempted to stock up on decorations, toys and other items of admittedly varying quality, but a good glug of spiced mulled wine down the gullet and a crepe warming your hand isn’t likely to make your mood any worse. Among my favorites include the annual market at St-Germain-des-Prés (generally a bit quieter than some of the others) and the Alsace-themed market at Gare de L’est (the Franco-German region where the traditional marché de noel has its origins. To figure out where to head this year, see my full guide to Christmas markets open in 2018 over at TripSavvy (generally updated sometime in early November, when dates for all the markets are announced). 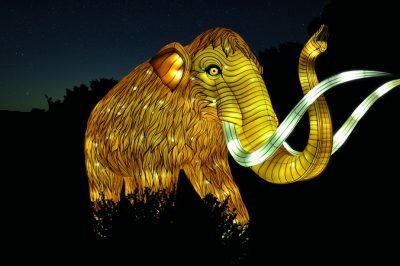 Meanwhile, holiday lights and shop window displays attract tourists in significant numbers every year; see this page for a list of where to enjoy the festivities this year. Streets I find especially beautiful when illuminated for the season include Place Vendome, Rue St Honoré, and Rue Montorgueil. Naturally, many will want to flock to the grands magasins (traditional department stores) to see their always festive and colorful holiday windows and lights. Galeries Lafayette and Printemps, both at Metro Havre Caumartin, are seasonal favorites, and perfect for a family excursion. At Galeries Lafayette and the adjoining Printemps store on Boulevard Haussmann, the window displays in 2018-2019 run through early January. 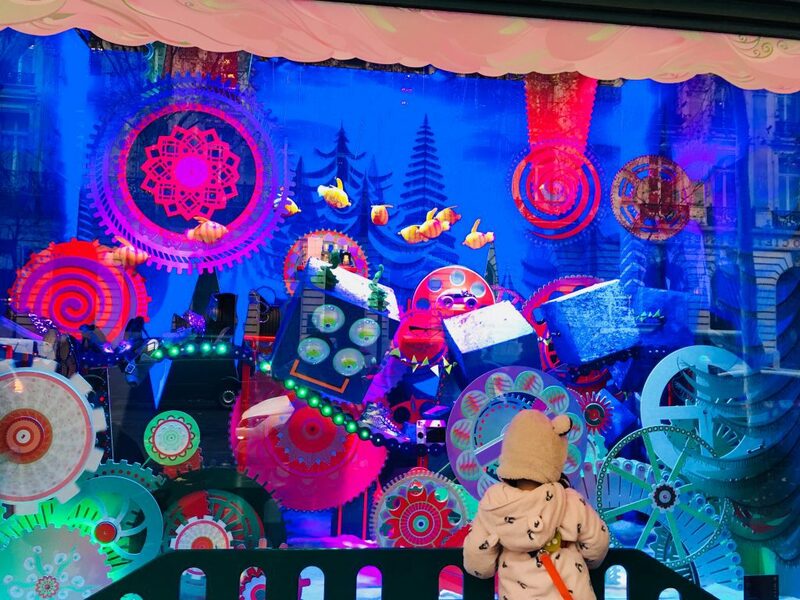 The theme this year at the Galeries is “Santa’s Workshop”: kids like the one shown in the pic above will generally find the spinning cogs and clocks, animated puppets and elaborate digital displays mesmerizing. 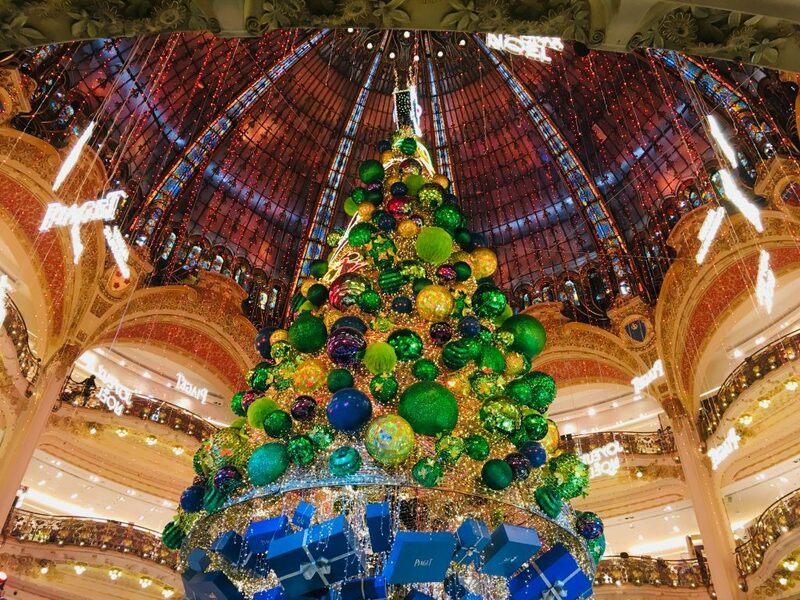 At Galeries Lafayette, the festive holiday window scenes are once again complemented by an enormous and opulent Christmas tree jutting up through the old glass cupola in the main hall. As much as I try to resist it, I can’t help but find it beautiful, especially set against the fine details of the hall’s Belle-Epoque architecture. 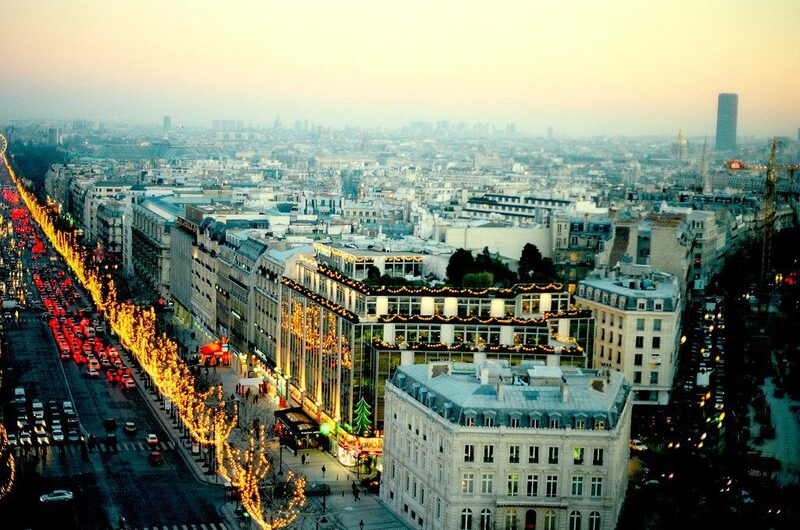 Parisians know how to do a grandiose holiday season better than anyone, it would seem. The Christmas tree at Galeries Lafayette in 2018, jutting up into the main Belle-Epoque cupola at the old department store. Image: Courtney Traub/All rights reserved. Finally, ice skating rinks are also a fun way to spend the day, particularly with kids; see a list of rinks open this year here. 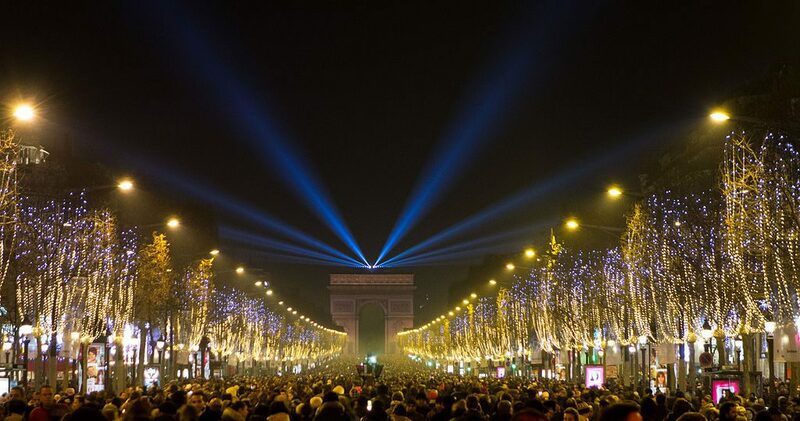 New Year’s Eve in the French capital can be a rowdy and remarkably overcrowded affair, especially in areas around the Champs-Elysées and the Sacre Coeur. 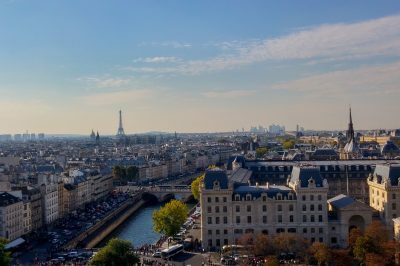 Of course, especially if you’re a first-time visitor to Paris and want to see some of its most iconic attractions in their holiday guise, you may decide the crowded conditions are worth it. My favorite, and far more relaxed, way to spend the occasion in Paris is to pick up a bottle of champagne or the less expensive but equally excellent Crémant de Loire or Crémant de Bourgogne and find a suitable place to celebrate: even a quick toast by the banks of the Seine can be very pleasant, albeit chilly! 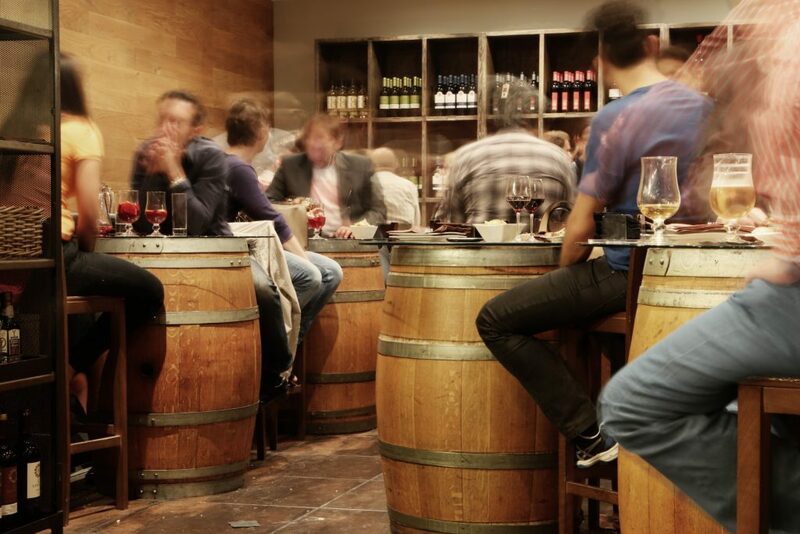 Alternatively, enjoy casual drinks at a bar or wine bar: many do stay open on the 31st, as owners know the night is a popular one for eating and drinking into the wee hours. There are a few fantastic shows to beeline to at year-end. 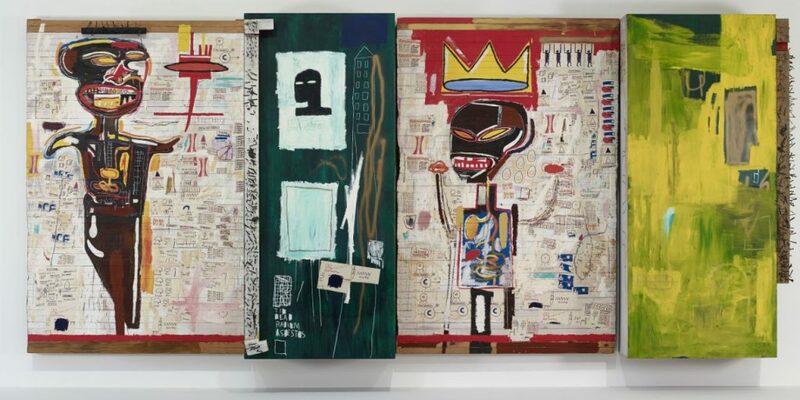 One is the Jean-Michel Basquiat retrospective at the Fondation Louis Vuitton, running through January 14th, 2019. One of the 20th century’s great visionaries, the American and Haitian artist is given the full spotlight in this vast homage, which showcases his numerous artistic influences and profound mark on the American avant-garde of the mid to late 20th century. See this page for further information and to purchase tickets. As always, I recommend reserving well in advance: this is a popular one and tickets sell out quickly. 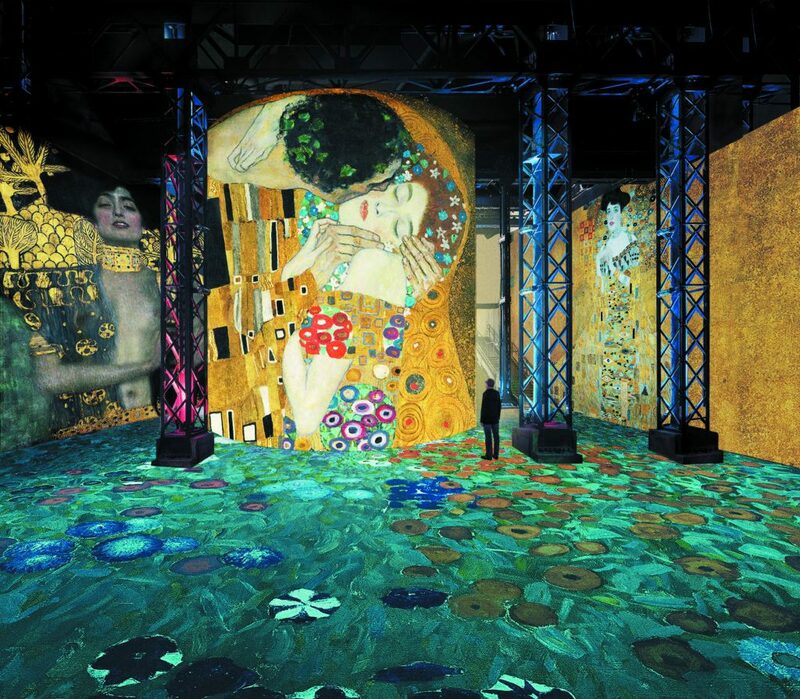 As I detail in my full review of the fantastic new digital arts and culture space known as the Atelier des Lumières, their inaugural exhibit on Gustav Klimt and the painters of the Viennese “Secession” movement is a sensory experience you’re unlikely to have experienced before. More than an exhibit, it’s an immersive experience and performance. Luckily for those who haven’t yet seen it, the show was extended from an end-date in November, now running through early January. For a more complete list of shows on in December of this year, this page has a good one.